The Minim House is an ultra-compact studio cottage with an array of innovative built-in and multi-functional furnishings. 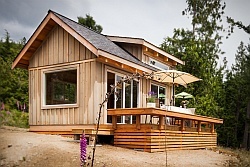 The tiny house was designed by Foundry Architects and Minim Homes to be efficient in every sense of the word: The floor plan makes great use of the minimal space, the materials and systems were chosen to use resources efficiently, and the house was designed to streamline the construction process. As Minim Homes is making the plans available for sale (see below), the designers looked for ways to make it easier for inexperienced owner-builders. The exterior has a very modern aesthetic with no window or corner trim, no overhangs, and hidden rain gutters integrated into the roof. 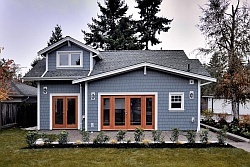 The main finishing materials are untreated cypress shiplap siding and charcoal gray metal roofing. The clean look continues inside with a mostly white color scheme, stainless steel kitchen and minimal trim. Other than the bathroom, it is one open living space. The lack of walls and vaulted ceiling both contribute to making the Minim House seem more spacious than its actual 242 ft2 (22.5 m2) size. The galley kitchen lines the end wall adjacent to the entrance, while the bathroom and a small office area with built-in desk are at the far end. To maximize the kitchen counter space, the two-burner cooktop is built into the counter with a removable cutting board cover. An 8′ long sofa is built in along one of the long walls. Its seat flips up to reveal the water filtration system and storage space below. There is plenty more storage with a large closet in the office area and bookshelves opposite the sofa. With no loft, you might wonder where the occupants are supposed to sleep. The sofa is an obvious guess, and it was in fact designed for occasional use as a guest bed. However, there is another, hidden bed. The office area is raised by about a foot, allowing a queen-sized bed to be concealed below. It pulls out like a drawer at bedtime and slides back in during the day. This clever design has obvious advantages over a loft bed, including eliminating the need to climb a ladder and making it much easier to make up the bed. The table can be raised/lowered and moved to one of four fixed locations via fittings set in the floor, allowing it to function as a dining table, coffee table, kitchen work surface or bedside table. The floor fitting idea was borrowed from the boating world, where it makes a lot more sense. But for a house on land, a table on casters would offer even more flexibility. The bathroom is an RV-style wet bath, with no separate shower. Instead the whole room is designed to function as a shower stall, with stainless steel panels waterproofing the walls and a shower curtain keeping water off the toilet and wall-mounted on-demand water heater. For ease of construction by inexperienced owner-builders, the walls are formed from pre-cut structural insulated panels. SIPs are relatively easy to assemble and save time by combining the wall structure, sheathing and insulation into a single step. The windows are few in number but large in size, saving the builder time on installation and detailing while still providing a generous amount of window area. The Minim House is ideal for off-grid use with a rooftop photovoltaic array and an integrated rainwater collection system with water filters. Heat comes from a small propane fireplace. SIP construction is very air tight so there is little heat loss due to drafts. Instead, controlled ventilation is provided by a heat recovery ventilator, which saves energy by transferring heat from the stale exhaust air to the fresh incoming air. 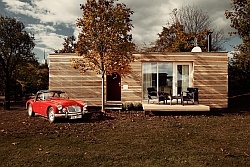 The Minim House can be built either on a standard foundation or on a trailer so it can be moved occasionally (at 11′ wide, a wide load permit will be required in most places). Foundry Architects and Minim Homes have put a lot of thought into getting the most from a tiny space. To purchase the plans, please see the Minim Homes website. Photographs by Paul Burk, courtesy of Minim Homes. For an increase in energy efficiency, you guys could change a few things within the construction and materials phases. 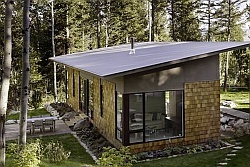 I would incorporate a “passive-solar” energy scheme with this construction; i.e. front door due south, north wall windowless, and changing the floor to concrete or masonry (to provide a better thermal mass for storing and releasing heat throughout the day.) I suppose this is assuming you get a decent amount of sunlight! To the home-owner: if you place your reference monitors in front of your projection screen (at ear level, and out of those bookshelves) you’ll get much better audio clarity. But don’t take my word for it! If these designs are a fraction of the size of a full-size house, why are they so expensive? I think the minimalism movement has a lot behind it. Personally I like it. I think it’s an easier way to happiness. Now, you can attain happiness without being a minimalist but what you’ll find is “things” making you happy, not experiences or people. I love the way our world is shifting! I am a reality TV casting producer at Crybaby Media in NYC. A TV network has asked us to look into companies that are in experts in designing/building amazing small spaces that enhance residential properties. If you are interested, or know of someone who would be, please email me at Melissa@crybaby-media.com. Thought… Wall system with a murphy bed/couch with removable back cushions when taking the bed down…shelves/cabinet/drawer combo.. That would take care of many needs all at once. Which btw would be something my retired husband and I would be very interested in.. A studio type tiny house like that on an acre of land someplace pretty and affordable for fixed income people.. Oh Yeah!!! Quit a coincidence we just spent a few days in Santa Fe, New Mexico and we met someone who asked if we knew of anyone local that specialized in building tiny houses. 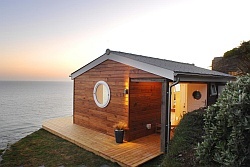 I really had not thought much about it but it did intrigue me and i guess my question to this community is how would you go about seeking out someone to build a tiny house? 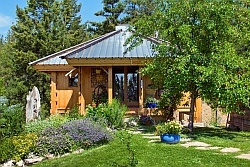 We have a local real estate website in Albuquerque, NM and I would like to have some information about local tiny house builders. I really like the concept.